The impact of technology on the healthcare industry just accelerated exponentially with January’s announcement that Amazon is entering the market. In partnership with Berkshire Hathaway and JPMorgan Chase, Amazon is forming an independent healthcare company to provide services for its 1.2 million U.S. employees. After an initial rollout to its own workers, Amazon plans to expand the service to Americans in general. Amazon’s entry into the healthcare market illustrates how technology is having a disruptive effect that is sending a ripple effect throughout the business world and society at large. The global healthcare technology market is expanding at an compound annual growth rate (CAGR) of 15.9 percent, reports Markets and Markets. This growth rate is driven by demand for lower costs, better care, more efficient information management and better data security. The impact of these technological initiatives is revolutionizing not only healthcare itself but business and society as a whole. Here are three ways healthcare technology advances are impacting not only the health industry but the way we live and do business. Just as mobile phones have revolutionized society at large, the ability to deliver healthcare over mobile devices has been transforming the healthcare industry. One of the most dynamic healthcare technology segments is telehealth, increasing at a CAGR of 18.3 percent and on track to reach a value of $113.1 billion by 2025, says Grand View Research. Telehealth applications are designed to make healthcare more accessible for consumers in rural areas, for people with limited ability to schedule hospital visits, for patients who need access to specialists and for individuals who want more self-service options. For example, a patient with diabetes can use a mobile device to transmit information about blood sugar levels and other vital data to a remote nurse for electronic review. Other examples of telehealth applications include instructional videos, calorie-counting apps, online portals for communication with doctors and automated reminders. Another part of the mobile revolution is the mobile payment revolution. Just as consumers are using online payments and mobile apps and services to conduct transactions in other areas of the economy, patients are increasingly using digital payment methods to pay for healthcare costs as well. Over half of all medical bills and over one-quarter of one-time healthcare payments are now made online, a survey by ACI and Aite Group reports. Eight out of 10 Americans now favor futuristic payment methods such as fingerprint and facial recognition, voice control and Bitcoin, according to e-payments provider Viewpoint. Mobile sharing of patient information and mobile payments have increased the requirements for securing healthcare data. The global healthcare cybersecurity market is projected to be worth nearly $10.85 billion by 2022, propelled by growing cyber attacks that target electronic patient health records, Social Security Numbers, intellectual property and other data. 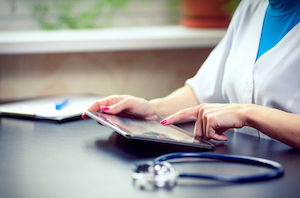 Digital security isn’t the only vector driving healthcare security technology. Wi-Fi security cameras with high-tech features such as 4K resolution and Color Night Vision are helping healthcare providers secure against on-premise security breaches, just as they are helping businesses in other economic sectors protect their physical perimeter. New mobile delivery options, digital payment methods, and stronger security standards are three ways technology trends in the healthcare industry are helping shape business and society at large. By changing the way services are delivered, paid for and protected, healthcare technology is helping transform the economy and the way we do business and live.